Simon & Schuster, 9781439124604, 496pp. The spellbinding story behind the longest debate in US Senate history: the Compromise of 1850, which brought together Senate luminaries on the eve of the Civil War in a desperate effort to save the Union. The Mexican War introduced vast new territories into the United States, among them California and the present-day Southwest. When gold was discovered in California in the great Gold Rush of 1849, the population swelled, and settlers petitioned for admission to the Union. But the U.S. Senate was precariously balanced with fifteen free states and fifteen slave states. Up to then states had been admitted in pairs, one free and one slave, to preserve that tenuous balance in the Senate. Would California be free or slave? So began a paralyzing crisis in American government, and the longest debate in Senate history. Fergus Bordewich tells the epic story of the Compromise of 1850 with skill and vigor, bringing to life two generations of senators who dominated the great debate. Luminaries such as John Calhoun, Daniel Webster, and Henry Clay—who tried unsuccessfully to cobble together a compromise that would allow for California’s admission and simultaneously put an end to the nation’s agony over slavery—were nearing the end of their long careers. Rising stars such as Jefferson Davis, William Seward, and Stephen Douglas—who ultimately succeeded where Clay failed—would shape the country’s politics as slavery gradually fractured the nation. The Compromise saved the Union from collapse, but it did so at a great cost. The gulf between North and South over slavery widened with the strengthened Fugitive Slave Law that was part of the complex Compromise. In America’s Great Debate Fergus Bordewich takes us back to a time when compromise was imperative, when men swayed one another in Congress with the power of their ideas and their rhetoric, when partisans on each side reached across the aisle to preserve the Union from tragedy. Fergus M. Bordewich is the author of several books, among them America’s Great Debate: Henry Clay, Stephen A. Douglas, and the Compromise That Preserved the Union, which won the Los Angeles Times Book Prize in history. His articles have appeared in many magazines and newspapers. He lives in San Francisco. Visit him at FergusBordewich.com. 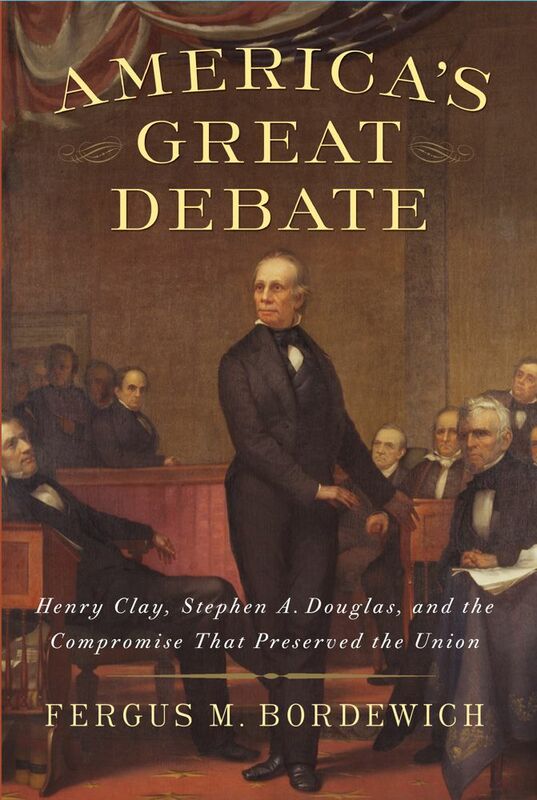 "[A] vivid, insightful history of the bitter controversy that led to the Compromise of 1850 . . . Political history is often a hard slog, but not in Bordewich's gripping, vigorous acount featuring a large cast of unforgettable characters with fierce beliefs." "Today's political differences pale in significance when compared with those that confronted Congress in the mid-19th century. What was at stake--as Fergus Bordewich reminds us in his stimulating, richly informed America's Great Debate--was nothing less than the survival of the nation." "Original in concept, stylish in execution, America's Great Debate, by Fergus Bordewich, provides everything history readers want. . . .[the] characters seem as vivid, human and understandable as those who walk the halls of Congress today." "A perceptive and tremendously witty book about the compromise that held the US together in the decade before the Civil War." "A lively, attractive book about a fearsome and almost intractable crisis: the tangle of issues involving expansion and slavery that confronted the political class of the United States in 1850. . . . Bordewich, the author of several books on American history, is a good writer—he knows when to savor details, and when to move things along."